It’s been an interesting, crazy and funny journey. It began with us all sat melting in studio in the unbearable heat, our fan rattling in the background a reminder summer has officially landed in England. It’s time to change the window display and celebrate the coming months! From the beginning flamingos were on our minds, trending tropical themes, white sandy beaches and funky sunglasses…now don’t you wish you where abroad right now?… So, how do we mash together the ‘feel of summer’? The road took me browsing the high street in Kingston. My eyes met by bright and dazzling colours, palm trees and inflatable wild animals! What’s trendy? What’s on the high street? Lollipops, ice cream, dinosaurs and … footballs…. (it’s coming home 2022, right?) summer themes filled the window displays at every shop. We wanted something creative, fashionable and fun for the little ones! On my prop shop I grabbed a couple of fresh pineapples, a little red parrot, 2 pairs of funky sunglasses, water melon hat, a little furry flamingo and a pineapple cup (which would soon become the most popular prop in my photo sessions) later, I was able to persuade my housemate to lend me her faux palm plant! With all the props ready it was time to start the photo shoots! 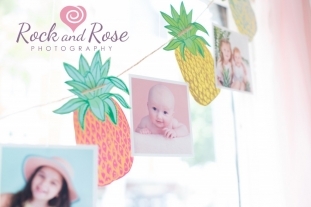 Blue, pink, yellow, mint and white backdrops worked the best, helping set the summer feeling scene. Our set ups where a huge hit with all the children, smiles all round and a buzzing atmosphere. Lots of fun playing with sand, palm leaves, beach balls, shells and monkeys. We ate pineapple and made a sandy beach mess! (sand in my socks and I’m still hovering up the remains). For a brief while the studio was transformed into a mini summer paradise. After the exciting sessions there was much debating, drawing and Pintrest mood boards but we all finally came to an agreement, a flamingo and pineapple theme with a hint of jungle fever. All we had to do was decide on materials! What looks good and what looks awful? Good old Ebay… We decided that a mint background would compliment the baby blue images and leafy green props, faux palm leaves would frame the window. Hanging pineapples and photographs (with a Polaroid feel) hanging like snapshots from a holiday in the tropics. 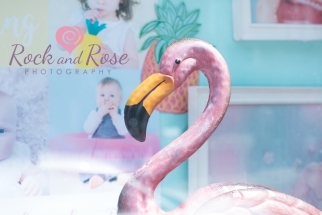 The model photographs I took in the studio will take centre stage and the wonderful pink flamingos Frank and Larry either side basking the sun. Even if it rains outside, our display will keep you smiling and dreaming of a tropical paradise. I want to say a huge thank you to everyone who has helped me with my model shoots over the past couple of months. 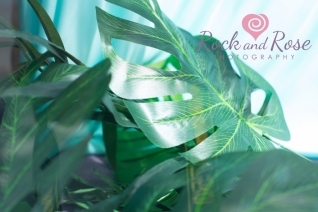 It’s been a pleasure meeting the little ones and creating fun, creative photographs for our new exciting summer window display and meeting all you lovely parents! It’s been a warm welcoming to the studio. The summer display is now ready for to see! Summer session are now available £25 session plus complimentary 8×6″ print, please call us on 0208 390 5558 to book!